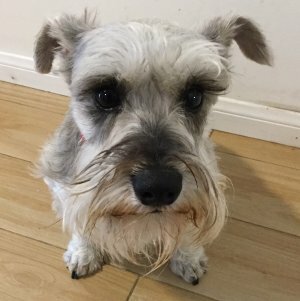 Available Dogs See Schnauzers! See Friends! Please come meet our furry friends at our dog adoption fairs. If you have any questions about a particular dog's availability you can email us at info@msfr.org (please do not call.. email us!). Please note that not all of our dogs are always able to attend our adoption fairs so please be sure and contact us via email before coming to meet a particular dog! Please note all adoptions are restricted to residences of the Los Angeles, CA and surrounding areas. See Adoption Policies for further details on our adoption process. 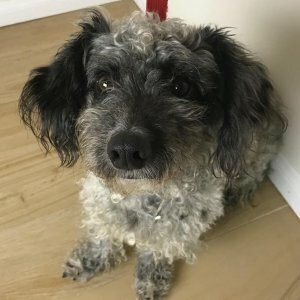 Marshall � 3 year old male Miniature Schnauzer/Poodle mix. Marshall was rescued from a LA area shelter where he came in as a stray. He was pretty matted and dirty which maybe why the public didn't adopt him. Marshall looks a bit like Toto from the Wizard of Oz.... only with a perm, our best guess at his breed is a schnoodle. Marshall is a friendly guy that gets along well with other dogs, in fact our preference is that he go to a home with another doggie pal. Marshall is approximately 16 pounds. 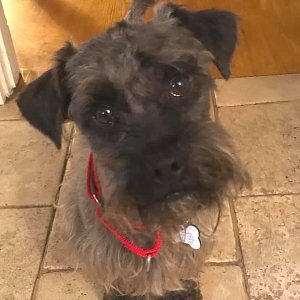 Malone � 1.5 year old male Miniature Schnauzer mix. Malone was rescued from a rural shelter after he was surrendered by his owner. While Malone is an extremely sweet boy who gets along well with other dogs and is very people friend he is NOT without issue. Malone has EXTREME issues with leash aggression (he can be a Mr. Hyde on a leash). We are working with him and a trainer and he is improving but Malone will require an experienced, patient ALPHA owner. He also needs a home with a fenced yard (No apartments or Condos).. Malone looks like a purebred schnauzer but has a little bit of a longer body.. he also has a natural tail. Malone is about 14 pounds. 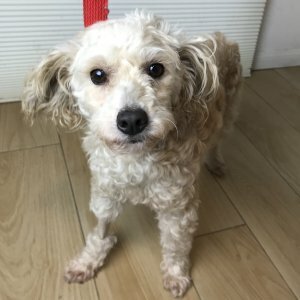 Flynn - 3 year old male poodle/doxie mix. Flynn was rescued from a LA county shelter where he had been dumped by his owners (reasons unknown). While we don�t know his history, we can can Flynn is a nice boy that gets along with everyone. We believe he is about 2 years old. He is a bit on the skinny side right now at 17 pounds. 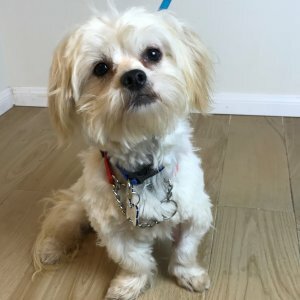 Harley - 1.5 year old male Havenese/Maltese mix. His breed is actually a guess� but whatever he is he sure is cute! Harley was rescued from a LA county shelter where he came in as a stray. He is very skittish but not aggressive. He would do best in a home with another doggie pal to give him the kind of confidence that he needs. Because of his skittish nature, he needs an adult only quiet home with a patient adopter, we are also requiring he go to a home with another doggie pal of similar size. Harley is approximately 11 pounds. Meadow - 5 year old female poodle mix. Shortly before Christmas Meadow ended up at a LA county shelter after presumably being hit by a car. We spotted her on their website and saw that she was in the medical building and thought she could use some help getting out. The shelter had sent her to a private vet where she had surgery to repair the fracture. She is seeing our vet for all the subsequent xrays and was spayed (and had a dental). After two surgeries for her broken leg Meadow is finally ready to go home. This sweet girl has waited a long time and we are happy for her! Meadow gets along well with other dogs but she really is a real people dog. She�s a small girl weighing approximately 14 pounds. UPDATE 4/3/2019: Meadow is finally ready for her new home! She just had her 2nd two month post surgery xray and the vet says she is healing properly and ready to go home! UPDATE 2/10/2019: Meadow's leg required 2nd surgery... she started limping and our vet xrayed her and found out her plate had broken. She had her 2nd surgery on 2/4/2019 to replace the plate, she additional required a bone graft to repair her leg. Meadow won't be available now until the end of March after she will have to have a post xray around 3/4/2019 and another around 4/1/2019.